A geekseye view. Or something. The Kazakhstan Adventure, Day Two: Poyekhali! – Let’s go! Today was the day I had looked forward to more than any other in the run up to the trip. Today was the day my friends were most jealous of. Today was the day we were to visit Baikonur Cosmodrome and watch a Soyuz rocket blast off with supplies for the International Space Station. Not even the rockets failure to fulfil its mission could diminish the brilliance of the launch. The day itself started incredibly early. Baikonur Comsodrome is around 250km away from Kyzylorda, and our journey there took a bum numbing four hours. 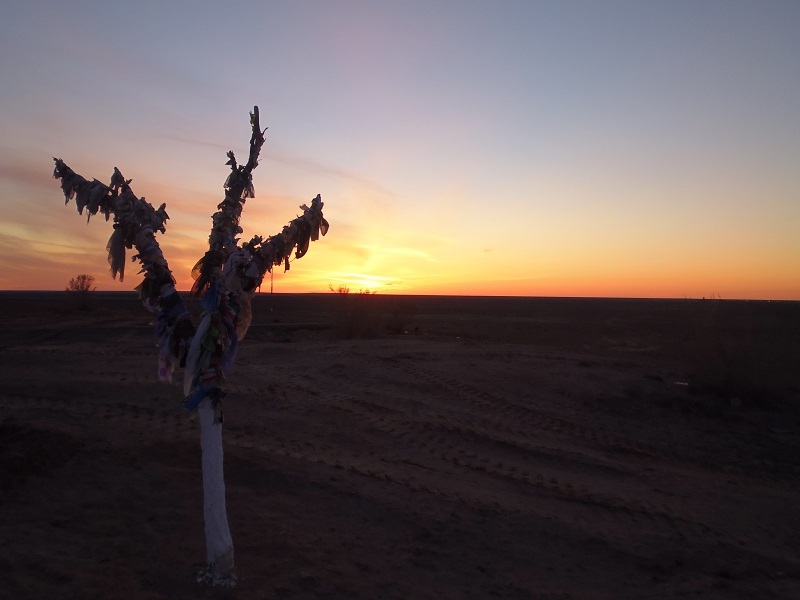 The consolation of such a long journey is that it allows plenty of time to savour the view, and thanks to how flat the steppe is, there is plenty of it, dotted with horses, camels and sheep, the core of the traditional Kazakh lifestyle. The uses for all three animals are many and varied, from transport to clothing, and from food to building materials. I will admit, though, that as good as the view was, after four hours on a hot and bumpy coach ride, I did start to tire of it. Before being granted access to the cosmodrome we had to stop so that a number of other tour coaches could meet with us, enabling us to form a caravan for the last part of our journey. This short stop allowed us to get some fantastic photos of the wild tulips that are found in the area, as well as sign an agreement to be on our best behaviour during our stay. Since Kazakhstan’s independence they actually rent the cosmodrome to Russia, and around 40 days before your visit you are required to fill in details about yourself for a Russian security check. Unless this check has been made, you will not be granted access to the cosmodrome. Because of this I was under the belief that a Russian visa would also be required. As it turned out, my passport was not checked once. As they say, though, better safe than sorry. The cosmodrome itself takes up a huge area, around 7,650 square kilometres in fact, and contains various launch sites for the different rockets. Baikonur was one of three possible sites in the Soviet Union for the cosmodrome and was eventually chosen due to its isolated nature, and its proximity to the equator. I would love to tell you the other two locations, but a) we were overloaded with so much information that day that I have forgotten, and b) the internet has spectacularly failed to provide me with an answer. And with that, we were rushed back to our coaches in order to make a hasty retreat from the launch area. One of the reasons that the cosmodrome was built in a remote location was that rockets such as the Soyuz have a multi-stage launching process; at each stage of its launch various parts are discarded, such as the booster engines used to gain altitude once the fuel inside is depleted. These parts inevitably come crashing to earth and ROSCOSMOS (the Russian Federal Space Agency), presumably, do not want them to hit anyone! On a side note, while waiting for the launch we had our first ‘Kazakh Toilet Experience’, or KTE for short. I won’t go into details, but I heard it opined by someone that the toilets in Kazakhstan were the worst they had encountered. Due to the remote nature of many of the best destinations, there is an understandable lack of plumbing, leading to some unpleasant facilities. Don’t let that put you off though, just be sure to do your leg exercises before going so that squatting won’t be a problem, and remember to keep toilet roll and hand sanitiser in your bag at all times. Following our hasty retreat, we made our way to the town of Baikonur, formerly known as Leninsk. As the town is technically on Russian land, even though it is inside Kazakhstan, it is unique in that it has law enforcement from both countries patrolling its streets. One thing that stands out about Baikonur is the fact it seems to be a town trapped in time. Unlike the, relatively, close Kazakh city of Kyzylorda, there appears to have been little new, modern, construction, and so it is a picture perfect Soviet town, with large blocks of flats dominating the skyline, and large communal areas filling the spaces in-between. The recent construction there has been, seems to follow the basic design guidelines set out during Soviet times. For those with an interest in Soviet architecture or history though, it is almost perfect. I shall skip over our afternoon as it was spent in a conference that was almost entirely in Russian and Kazakh. I will admit, it was all a little beyond my, very, rudimentary Russian language skills! 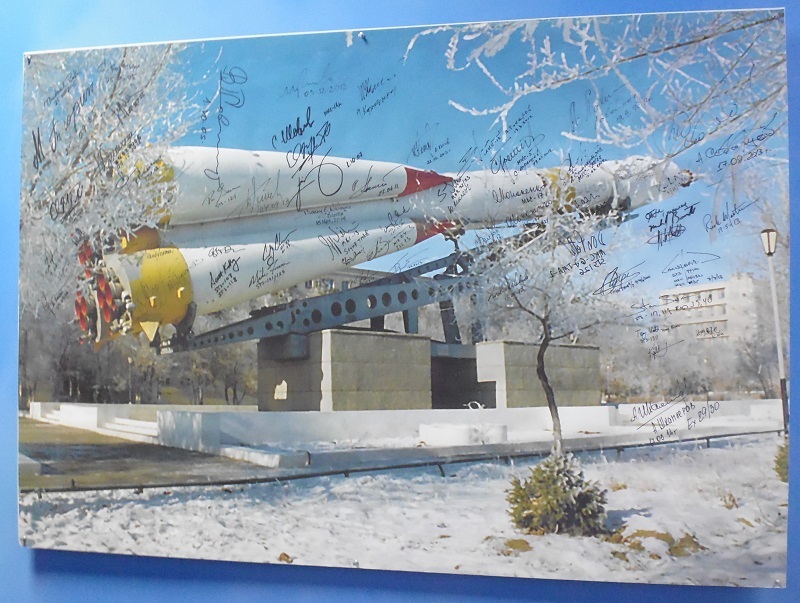 Before departing Baikonur we were permitted a short amount of time to visit their museum chronicling Russia’s history of shooting for the stars. Among the fantastic artefacts are replicas of Sputnik 1 (the first satellite) and Sputnik 2 (that carried the first animal into space, Laika the dog). We were given a guided tour (one of the few of our entire trip that was available in English) that was very thorough. Perhaps too thorough, as there was a huge amount of information to take in; though, like all the museums we visited, the written descriptions for each item were in Russian/Kazakh, meaning a guided tour is the only real way to get the most out of the experience. One quirk of note, that is important to remember if you are planning a visit, is that if you would like to take photos inside the museum you must pay. In Roubles. Remember, you are technically on Russian soil after all. Luckily they will accept Tenge, but be sure to have the correct amount, or close to the correct amount, as the change they give will be in Roubles at a rate they have decided, and you probably won’t want to carry a pocketful of Roubles, that you cannot spend, for the rest of your trip. For me, permission to take photos cost 800 Tenge, or about £3. Souvenirs are priced in Roubles also. A replica Soyuz rocket, not quite full size! As the evening came it was time to hop back on the coach and venture back to our accommodation in Kyzylorda; with a short stop over at Korkyt Ata Mausaoleum. The mausoleum was built to honour Korkyt Ata, a man who lived in the in the 8th and 9th centuries. He is said to have travelled throughout Central Asia bringing happiness to people through his music and poetry, inventing what is claimed to be the first stringed instrument, the kobyz. On any ordinary day the mausoleum would have been a stunning monument to Korkyt Ata but, with the help of a stunning sunset, we were treated to quite the view. Inside the monument the centrepiece is an amphitheatre-like tiered bowl, inside which traditional folk shows and concerts are often presented. We were not lucky enough to see one that evening, though. My favourite element was the ‘wishing pyramid’ that is down a set of stairs and through a small doorway to the rear of the complex. It is a large, white, indoor pyramid in a pyramid shapded room with a small skylight in the ceiling, around which you are meant to walk three times and then make a wish. Inside this room it is very peaceful and still, the perfect combination after a hectic day. After 30 minutes or so we moved on for dinner before finishing our long journey home, arriving back in Kyzylorda at around 1am. It was a very long day. No rest for the wicked though, as the following morning we were up early again for another epic journey from Kyzylorda to Shymkent via Turkestan, featuring some very photogenic lizards! FULL DISCLOSURE: I originally posted this on www.realrussia.co.uk/blog under the title ‘The Kazakhstan Adventure, Day Two: Poyekhali! – Let’s go!’. Words, images and video are all my own. 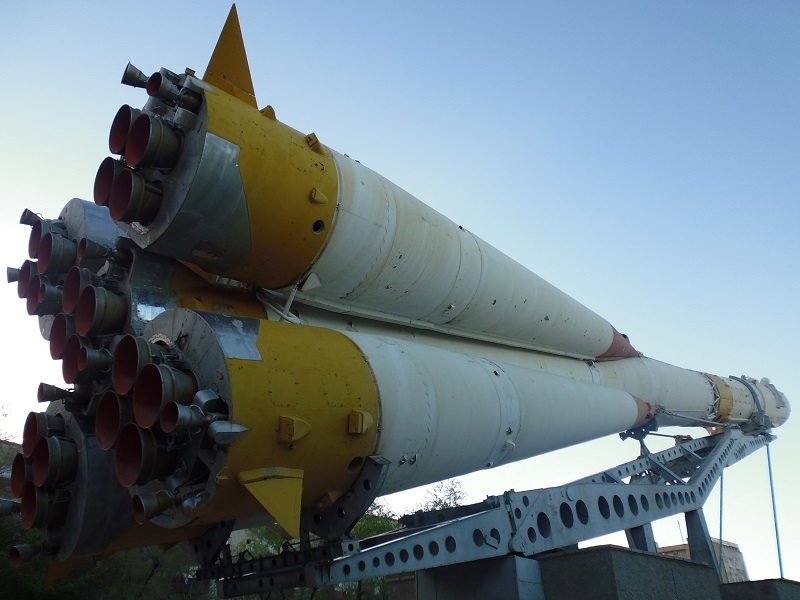 This entry was posted in Kazakhstan and tagged Baikonur, Baikonur Cosmodrome, Cosmodrome, Kazakhstan, Korkyt-Ata, Kyzylorda, Space Travel, Travel. Bookmark the permalink. 1 Response to The Kazakhstan Adventure, Day Two: Poyekhali! – Let’s go!